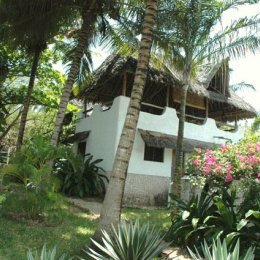 Built in the traditional African style, the cottage has one bedroom with private bathroom. On the ground floor there is a verandah with a living room and a sitting room that faces the kitchen. The bedroom is on the ground floor , facing the garden and swimming pool. In the wide veranda the dining area and a comfortable sitting area. Shambani is nestled in a lush tropical garden of 12,000 square metres, overflowing with plants and bordered by more than two thousand plants bougainvillea multicolored. The property is absolutely safe, peaceful and clean. On your arrival at Shambani, you will find your charming cottage ready to welcome you. They are fully and elegantly furnished with fully equipped kitchens and fresh linen provided for your comfort. The quoted price includes daily cleaning and laundry services, electricity, water and gas. For an even more comfortable holiday, the cottage can provide you with a cook and do the first shop in order for you to find a full and inviting pantry on your arrival. 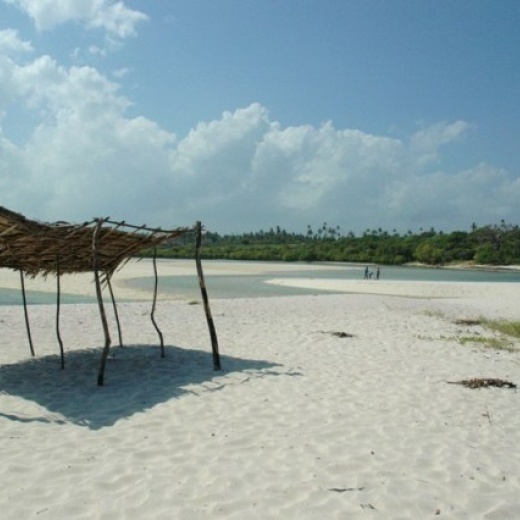 Plan your journey from Mombasa Airport to Shambani and arrange for a rented car to wait at Shambani's, should you wish to have one at your disposal during your stay. Shambani's surrounding five giant baobab trees, camel food, hibiscus, red ginger captures captures the visitor's gaze at first sight. We had a really good stay. The environment at Shambani is great and the cottage we were given was spacious. The monkeys were a bit problematic though. We appreciated the assistance from SleepOut and will be using them again. Overall our stay was okay. Only problem was that the place is a little run down and neglected. They could definitely take better care of the place and do some landscaping at the very least. Plus the resident dogs are not nice at all and no one is really taking care of them. The pool was probably the nicest place in the whole compound. The location was perfect as it is close to the beach. The cottages themselves were nice and it was great that they had A/C and the pool was super. The only drawbacks was with regards to the cook and the cleanliness. The food made by the cook who was made available to us was just there. Nothing to write home about. The cleanliness was wanting and the cleaners themselves looked unkempt. All in all, our stay was great. Lovely place, quiet, peaceful... beautiful clean pool, beautiful gardens. Very short walk to the beach (although it may not feel like it in the midday sun!!) We will be coming back! Our stay was fantastic. Had a small problem with the internet but this was fixed in under 15mins. Apart from that, everything was perfect. Shambani cottages were great. We were made to feel very welcome, nothing was too much trouble and everyone was very friendly and helpful. Beautiful homes, gardens and surrounding area. I'm already looking at returning! We really enjoyed our 5 night stay at the cottages. When we arrived it really was like we expected, maybe even more beautiful than the pictures online represented. When the electricity switched off, they turned on the generator. The ladies cleaned our room and did our laundry. The cook helped us to get rid of one of the monkeys in our cottage. All the staff were really very friendly and helpful. Though at the end of the road, 5-10 min by tuktuk to the supermarket, we enjoyed the tranquillity and the silence. Also, you just need to cross the street and you will reach the beach within 5 minutes. Awesome place with very hospitable staff. Perfect place for relaxation. It was awesome. Very very good place with great and very hospitable staff. We really loved and enjoyed our stay. we will definitely visit again. We quite enjoyed our stay at Shambani Cottages. We were very surprised at the beauty of our Flamboyant Villa. It was great. Apart from the check-in process where it seemed the staff had not been informed of our arrival in advance, we had a lovely stay. The staff were fast in preparing the place for us and were good. Extremely friendly place with very helpful staff and impressively service minded. As a mother alone with three children I felt very safe and well taken care of. Beautiful garden, it feels like you are in the jungle. The children fully enjoyed the swimming pool and our house was comfortable and spacious. We will definitely come back! We enjoyed it. It was a good place. We didn't have any difficulties. Paulo is a great host. It was amazing! I love this place. Absolutely fine. The caretakers Salim and Binti were fantastic. It was very peaceful. You're in the trees and lots of flowers in the garden. 2-minute walk to the beach. Pool was great to avoid getting hassled by the beach boys. I have nothing to complain about...the hospitality and services at Shambani are second to NONE!!!! Very beautiful place; quiet, nice staff. Well worth staying there!!! Great place with splendid service. We all had a lovely time. We will be back. Shambani, simply put, has very courteous staff who will always make you feel at home. We enjoyed very much staying at Shambani Cottages. Only minus is that location is not right at beach.